Brandon Thomas-Asante has been sent on-loan to National League side Sutton United on loan. The affable 19-year-old has been limited to just two first team appearances this season due to injury, and departs for Gander Green Lane until the end of January. Thomas-Asante netted four goals for the U23s earlier this week when they beat Southend 6-1, but manager Paul Tisdale said competitive football, rather than reserve team games, will help improve the youngster's game. "It's a really good opportunity for him to go out to the National League for a manager who likes to play young players and develop centre forwards," said Tisdale. "It will be a good month or two for him there, and like all our young players, they're out of sight but not out of mind. 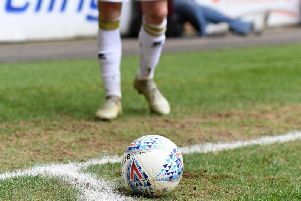 "It's good to see how they cope with different environments, form new relationships, how quickly they can do that, and deal with the ups and downs of competitive football. "Reserve football is great but it doesn't quite give you that level of competitiveness that a month or two in the National League will give him. I'm really looking forward to seeing how he gets on." Speaking about his performance in the U23s, Tisdale added: "It's the performance you need for players on the periphery when they play in the U23s to put pressure on those in the team. It might not be for this week, but for next week or the months to come."